Australia was supposed to be a focal point on our trip. Not only is travel there easy in terms of language and infrastructure, but Matt would be able to eat almost anything. There is plenty to see and do, and plenty of country to cover. Our plans changed though. Before arriving in Australia, we had just spent four months in Asia instead of the initially planned six weeks. After this much time traveling through countries where cultural differences sculpt the experience, it is tough to re-adjust your expectations to exclude this. We were not prepared mentally to switch over to western life just yet. It was also the absolute worst time for Aussie to US dollar exchanges. This made Australia so expensive that it was impossible for us to spend longer than a few weeks in the country without harming our budget. We also had to split up our time in Australia in order to take advantage of the dwindling warm weather in New Zealand. It kind of hurt the momentum. Our first leg in Australia lasted about ten days and took us through Melbourne, Adelaide, Kangaroo Island, and Ayers Rock, all with Matt’s parents. Our second leg lasted about 12 days and took us to Manly, Sydney, Trinity Beach, Port Douglas, and finally Darwin. The gap between the two legs was six weeks long, which were spent on a road trip from Auckland down to Queenstown, New Zealand. Despite our difficulties with Australia, there are some amazing places in this country that are unforgettable – like Katja Tjuta and the Great Barrier Reef. Here are a few of our favorite things from our 22 days in Oz. 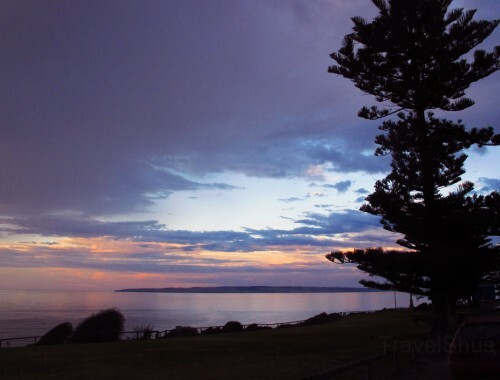 A drive along the Great Ocean Road is a must for all travelers who come to Melbourne. The road is lined with beautiful views and incredible rock formations. This was also our first experience with left-side driving on The Trip. Stressful for Matt, stressful for Annie. The water along the entire coast of Eastern Australia is colored vibrantly – aquas, blues, turquiose…even in the water surrounding the cities. In Argentina, we spent time with a girl named Rosie, who lives in Melbourne. She was traveling through South America at the time, but when we made it to Melbourne, she had come home. We all spent an evening walking around the city and drinking wine along the river. We spent two days on Kangaroo Island, an island off the coast of Adelaide. Here, the thing to do is go on an Australian safari through the island looking for local wildlife like kangaroos, wallabies, koalas, wombats, and fur seals. We came at the wrong time of year for penguins so we missed them entirely, unfortunately. However, I really really really want a grey kangaroo, like this one. Yes I do. The water around Kangaroo Island is also pristinely blue. The Barossa Valley is one of the premiere wine regions in Australia for Cabernet Sauvignon and Shiraz. As phylloxera(a grapevine killer that has plagued most of the grape-growing world) has not surfaced in Australia and New Zealand, the vines here are typically much older that anywhere else. Langmeil Winery is home to the oldest commercially active grape vines in the world at 169 years old. Deep in the center of Australia, Ayers Rock is an iconic symbol of Australia and its Aboriginal roots. 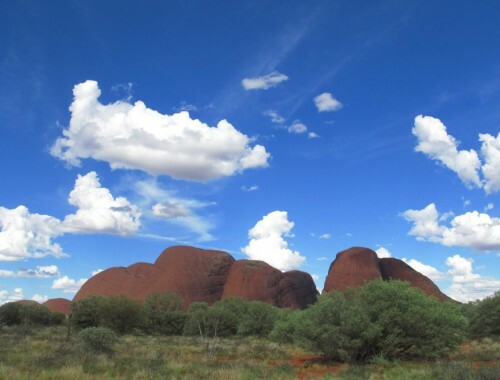 A trip to Ayers Rock is both educational, breathtaking, as well as annoying. The desert is infested with flies, which have no problem landing on any part of you whenever they choose. 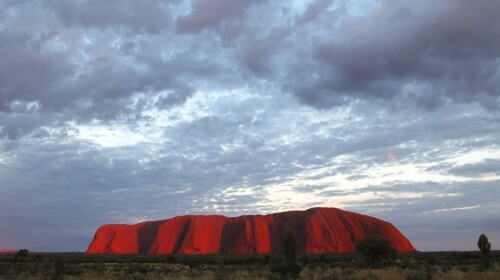 The area, however, makes up for this annoyance with stunning sunrises over the iconic rock and its famous red earth. Camels apparently run wild in the Nothern Territory. Riiiight. Manly Beach is only a 20-minute ferry ride from Circular Quay in Downtown Sydney. Even though it’s so close to the skyscrapers, it has its own small town feel. 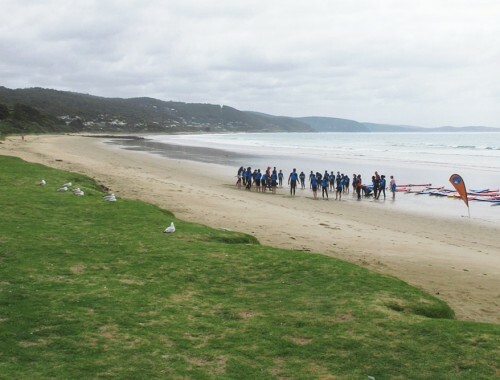 The beach is wide and the waves are filled with surfers of all skill. The weather and the surf were both cold when we arrived in Manly, but the laid back vibe made of a good first destination on our second leg in Australia. 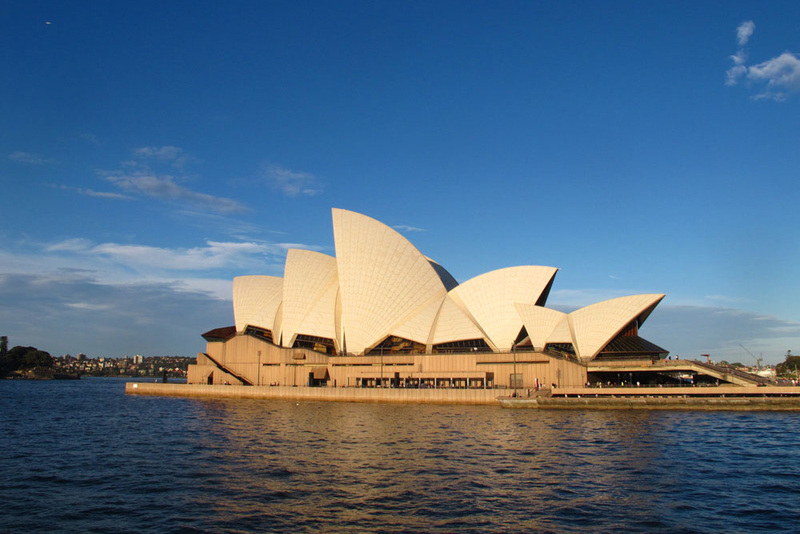 Another icon of Australia, the Sydney Opera House is also a must see for travels to Sydney. Australian Rules Football is one of the weirdest games I’ve ever witnessed. Seriously. And I’ve even seen the movie Baseketball. Nonetheless, going to see this local favorite sport at the Olympic stadium in Sydney to cheer for the Sydney Swans made for a good day to experience something that’s uniquely Australian. Queensland was supposed to a sunny beachy place for us to spend my 30th birthday. Instead, storms had ravaged the area for weeks, rendering the sea unswimmable due to the presence of poisonous jellyfish and a lack of netting. The clouds did part after three days in Trinity Beach to give us three sunny ones in Port Douglas. The Saturday market in Port was set on the water, offering produce, furniture, and crafts. The Great Barrier Reef is a main attraction for those traveling to Queensland. We are not divers, so we set out on a snorkel trip to see the far out reefs outside Port Douglas. Our trip took us to three spots, where one of them was definitely one of the best coral reefs we have seen. It was teeming with fish and only sat several feet below the surface of the water. We wore stinger suits to protect ourselves from possible stings from the stupid evil Australian box jellyfish. Darwin was more of a stopover for us on the long trip from Cairns to Bali. With only nine hours to explore, we spent most of the time in art galleries admiring Aborginial paintings. We felt extremely blessed when we were gifted a painting by a shop owner. We were additionally lucky as the artist was in the shop. It was kismet to own the painting, so we happily accepted it into our already 0verstuffed backpacks. I’m slowly being convinced that perhaps I should go to Australia someday. Perhaps on our next trip to New Zealand we’ll spend a week somewhere in Australia. its worth seeing. its not exotic to me, but there are some beautiful places and interesting animals to check out.